Nothing. The training is funded by the Scottish Government. Will I be paid to attend training sessions? No. Your attendance will need to be agreed by your organisation or if self employed you need to cover your own costs. Who is coordinating this programme? The Scottish Community Development Centre, which runs PB Scotland, is co-ordinating the programme on behalf of Scottish Government and the Scottish PB working group. PB Partners is developing and delivering the training offer. SCDC will accept applications, which will be assessed by the national PB working group. SCDC will inform candidates of the outcomes of the selection process. SCDC will provide course information and handle all accessibility requirements. PB Partners will deliver the training and will provide a mentor throughout. SCDC will provide support for training attendance and will co-ordinate work shadowing opportunities. SCDC and PB Partners will be jointly responsible for quality assurance and assessing the satisfactory achievement of learning outcomes by course participants. When must, may or might you need to be available? You must be able to commit to at least two full day’s training, most likely to be delivered in one block, one additional day for a work shadowing experience, and one half-day follow up training. This is likely to equate to around forty hours commitment, which will include a practical assignment to build and share learning, travelling time and background reading. It is expected that you will be able to this as part of your existing role sponsored by your employer, or on a self-employed basis. The programme will set out a series of learning outcomes accompanied by indicators describing how each outcome will be met. The programme is not accredited. On completion of the training participants will receive a certificate from the national PB working group verifying that they have completed the learning requirements. 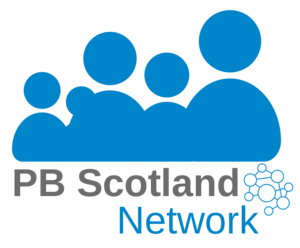 Successful participants will have their expertise recognised by a profile on the PB Scotland website. What reimbursement you will receive? Travel costs to work shadowing locations will be reimbursed. If the training is out with a fifty-mile radius from your home location, overnight accommodation will be paid for if required. Additional participation costs will be assessed on a case by case basis.